“You must visit Santorini” my Greek friend told me on numerous occasions. “It has the power to make people fall in love all over again.” This isn’t the first time I’ve heard Santorini, the archetype of the idyllic Greek island described so mysteriously. One wonders if its mystique is related to a belief that the mythical ruins of Atlantis lie buried underneath its cerulean waters. True or not, it was time to find out what makes Santorini one of the world’s most beautiful and beloved places even if it meant we only had one day to spend there on our Mediterranean cruise. Officially known as Thira, the island of Santorini was transformed by lava from a massive volcanic eruption in 1660 BC. There are few travel destinations that combine beautiful beaches, spectacular scenery, ancient cities, amazing restaurants, some of the world’s best wine and an active volcano. And fewer yet that can completely capture the imagination, even before setting foot on its mystical soil. Huge, towering cliffs, rising from the ocean floor loomed over the landscape on our approach to the island and Santorini’s port. Like an enormous crescent moon, the island encloses the crystalline cobalt waters of its ancient caldera. Its unique shape accurately reflects the fact that it along with its three smaller adjacent islands form the remnant of the rim of that ancient volcano that erupted. The adventure began as we stepped off the boat in Santorini’s small harbor. To get to Fira, the small village that serves as the cultural capital of Santorini is no easy task. Visitors can take a slow, steep funicular (cable car) to the top, hike the 580 twisting winding steps with numerous switchbacks or take a donkey ride. We took the donkeys, though recently there’ve been mixed reviews concerning the well-being of the animals. So, in doing it all over again, we’d likely opt for the stairs and eliminate standing in a long line for the cable car. 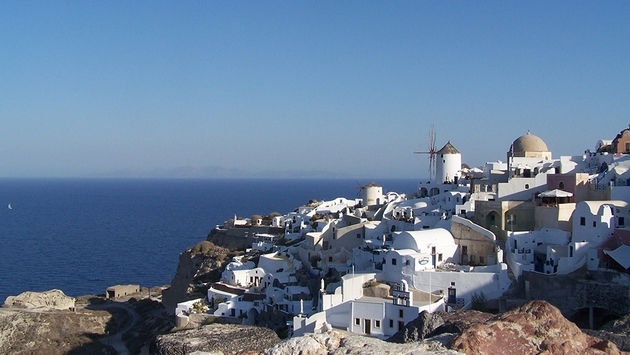 From Fira’s lofty summit, we were treated to miles of stunning panoramic views that completely captivated us. 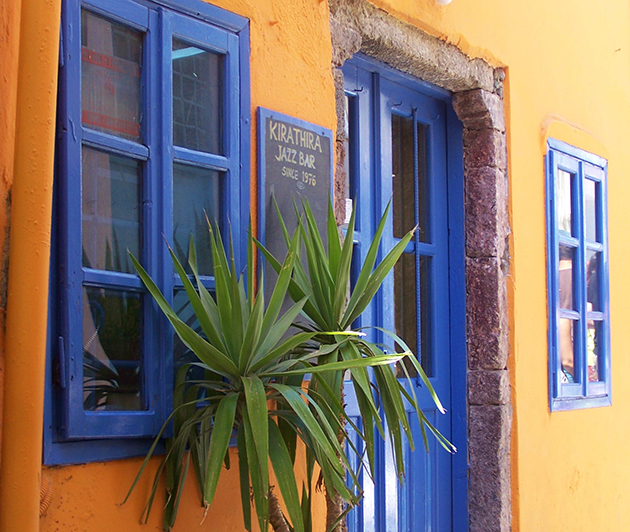 Quaint cobbled streets weaving through the town led past small boutiques brimming with jewelry, artisan treasures and local crafts. Charming and colorful restaurants offering traditional Greek fare added their magnetic appeal. At Lithos Restaurant, we were properly introduced to an authentic Greek Salad, a delicious lettuce-free dish consisting entirely of fresh, tantalizing pieces of tomato, feta, and of course, crisp Greek olives. And the views from our open air outdoor table were resplendent and almost beyond comprehension. Renting a quad motorbike for two from a vendor around the corner in Fira allowed us the freedom to easily travel around the island. With a well-marked map provided by the rental company, we were off on our next adventure. There was no fear of getting lost as the island is only 35 square miles. Our first plan was to visit at least one of island’s wineries located in the countryside. The wines of Santorini were famous all over the Mediterranean basin in ancient times and still captivate its many visitors today. Santo Winery’s innovative architecture is remarkable, as it’s built on different levels terracing the vineyards below. These terraces offer magnificent, awe-inspiring views of the caldera, volcano and the Aegean Sea below. Its volcanic soil and special climate give a unique earthy, mineral taste to the wine. They are vibrant, full-bodied, with citrus-fruit aromas. And with the majestic panoramas before us, they tasted like liquid gold on the palate. Though not necessarily known for idyllic beaches, the volcanic content of the island’s beach sand produces some fascinating colors. One of the most well- known beaches is Red Beach with its coarse red sand and rocks richly contrasted against the crystalline waters. It’s a moderately easy trek from the road to reach the beach after a slightly inclined and a somewhat narrow path, but the reward at the end makes it all worthwhile. Our next stop on the quad was the town of Oia (pronounced ee-ya) located on the northern part of the island and undoubtedly the Aegean's most-photographed village. The picturesque town situated atop an impressive cliff is sleepy and quaint. Stepped terraces offer spectacular views over the volcano, Palia, and the nearby island of Thirassia. Its charming dazzlingly chalk-white houses, narrow meandering streets, blue- domed churches and sun-bathed verandas sprinkled with scarlet bougainvillea provide breathtaking views invoking powerful emotions and intense feelings seen only in postcards. But no postcard was ever so lovely as the stunning vista we enjoyed and imprinted forever to memory. Each narrow street led to yet another fascinating architectural gem. The maze of cobblestone streets are dotted with colorful hyposkafa buildings dug into the rocks, Cycladic windmills in the distance, sea captains’ houses, old wineries, luxurious hotels, restaurants, cafes and elegant shops. 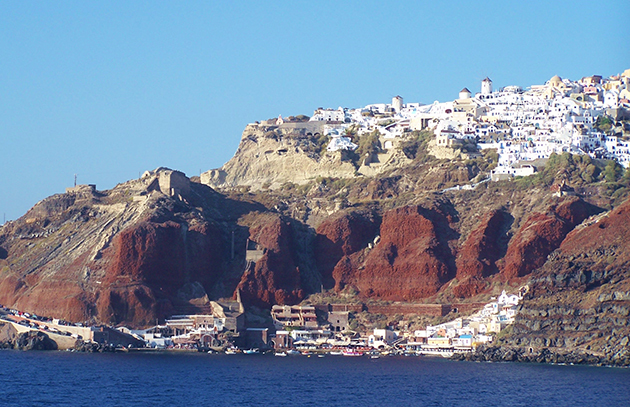 The sun began its drop in the late afternoon sky as we made our way back to the town of Fira. Wind whipping through our hair carried the fragrant scent from nearby olive groves. Each twisting bend in the road left behind yet another amazing but fleeting view of the island that we never want to forget. As we stood on the deck of the ship sharing a glass of wine departing this unique magnificent island, a quote by Henry Miller came to mind “It takes a lifetime for someone to discover Greece but it only takes an instant to fall in love with her.” We silently regaled in the magical allure of Santorini, sharing a toast under a glorious and unforgettable Aegean sunset. Our friend was right.